Together with CADFEM we have developed the ANSYS Workbench extension “VDI-Wärmeatlas inside ANSYS”. 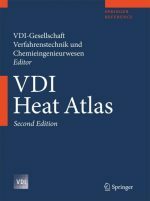 The VDI heat atlas has been an indispensable tool for any engineer dealing with heat transfer issues for 60 years. The standard work, recognized in industry and engineering, enables the design of technical equipment and equipment, e.g. in process and energy technology. For this purpose, data are provided, calculation methods for heat transport in solids and fluids are explained in detail and constructions of heat exchangers are presented. Extensive collection of physical properties and methods for technical and industrial application in the process industry and thermal energy technology . Written by industry and science specialists within the VDI. Since the 5th edition (1988), the individual chapters have been implemented under license as a calculation program of Lauterbach VT and have always been adapted to the current requirements until the current 11th edition. The ATLAS modular system made the practical application of the chapters and their combinations into processes much easier. Each chapter corresponds to a module. These modules can be integrated into the individual problem and extended with their own calculation equations. Why should you lavishly simulate phenomena for which there are proven analytical approaches? >> Save time and money by replacing parts of your simulation with calculations based on the VDI Heat Atlas. Why should you rely on estimates when there are accurate calculations? Each simulation is only as good as the boundary conditions you define for it. Place them on a solid footing: The VDI Heat Atlas. The “VDI Heat Atlas inside ANSYS” tool connects the software of Lauterbach Verfahrenstechnik GmbH, which is based on the VDI Heat Atlas, to the ANSYS Workbench. In 60 minutes webinars, the integration of the VDI Heat Atlas into ANSYS Workbench is shown in examples. The requirements for the fineness of networking are many times higher than with other CFD models, and the interpretation of the results requires a great deal of experience. If phase transitions also play a role, the complexity increases. If in a simulation the mechanism of heat transfer itself is not the subject of the investigation, it makes sense to outsource it to a separate calculation in order to make the simulation faster and simpler. Especially in process technology, the calculation of pressure losses plays a major role. For many standard elements, the VDI Heat Atlas offers the possibility to analytically determine the pressure loss and to incorporate the result back into the simulation. Gas-liquid flows can also be calculated. In addition, there is the possibility to define material values for mixtures of up to ten components (including phase balance weight calculation) on the basis of the Dortmund database. Separators (e.g. cyclones), pressure loss calculations, condensation, evaporation, heat radiation, combustion, thermodynamics. Your simulation is complex, but is it partly made up of simple cases of heat transfer and flow theory? For individual components, is it not of interest to dissolve the results locally? Then it would be a waste to simulate these elaborately and in detail, rather than performing a simpler analytical calculation. You perform a thermal simulation, but the heat losses to the environment you estimate for gut feeling? You simulate a high-temperature system, but the physical properties can only be found on Wikipedia at 20°C? This allows you to create a source of error from the outset, because a simulation cannot be more accurate than the specifications it is fed with. The LV software is modular, with the user interface of each module serving at the same time as the value input, result output and documentation. The interface can link parameters of the ANSYS simulation to values of the LV program in both directions: Transfer from ANSYS to LV and from LV to ANSYS. The creation of such a link is very easy by drag and drop. Founded in 1985, CADFEM is one of the pioneers of the application of Numerical Simulation in Product Development. With 10 locations, 220 employees and 130 simulation experts in Germany, Austria and Switzerland, CADFEM is one of the largest European providers of simulation solutions. Software and IT solutions. Consulting, support, engineering. Transfer of know-how.